The Taurus Premium Barbell Set 200 kg is the perfect equipment for a strength training at the highest level – be it at home or at the gym. 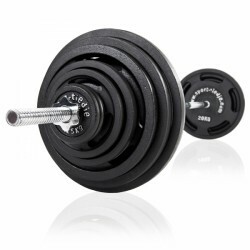 The 60 kg Barbell Set is the perfect equipment for a barbell training at home. This set consisting of a barbell and weight plates allows to perform a great variety of barbell exercises for all large muscle groups. The Taurus Premium Barbell Set 160 kg is the perfect equipment for a strength training at the highest level – be it at home or at the gym. The 90 kg Barbell Set is the perfect equipment for a barbell training at home. This set consisting of a barbell and weight plates allows to perform a great variety of barbell exercises for all large muscle groups. The 120 kg Barbell Set is the perfect equipment for a barbell training at home. This set consisting of a barbell and weight plates allows to perform a great variety of barbell exercises for all large muscle groups. Do a varied workout with the Ironmaster Quick Lock barbell bar 167 cm. 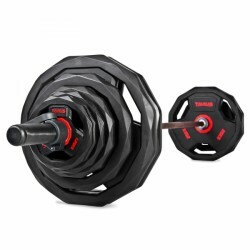 Ironmaster Quick Lock weight plates, which have a special mould and holder shape, are put on the barbell bar (167 cm). Ironmaster realized again successfully to combine best quality with high safety - the Quick Lock barbell bar. 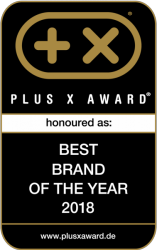 Great product. Uses spirals for collars, which takes a bit longer than I'm used to in the gym, but not a major issue. Overall, very happy with this. Barbells are perfect for strength training. 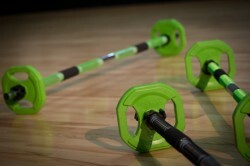 Muscle building, maximum strength, and strength-stamina are equally exercised with barbells. This versatility makes this training device an essential part of strength training. 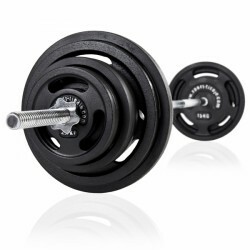 Strength training exercises like bench press or squats cannot be imagined without the barbell. In combination with a Power Rack and a weight bench, the whole body can be exercised with a barbell. 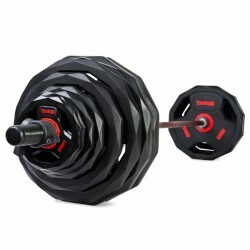 Either for strength sports or fitness training, find the appropriate barbell in our great selection. 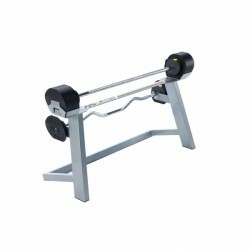 Find either professional barbells with 50 mm holding fixture as well as aerobic barbells, so called pump sets. 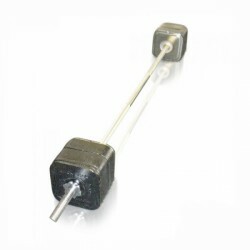 We also offer weights with 30 mm holding fixture for strength training at home in our range of products. When you purchase a barbell, you should mind a sufficient length of the bar, so it is suitable for your fitness exercises and fits to the rest of your fitness equipment. The thickness of the holding fixture for weight plates should also be considered. In general, bars are differentiated in 30 mm and 50 mm. 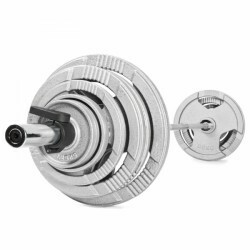 Our fitness webshop also offers complete barbell sets for immediate start of your barbell training.